It's Show & Tell time again! 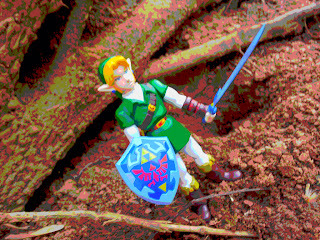 Now Link is playing with power- Nintendo Power! Released on November 23rd, 1998, The Legend of Zelda: Ocarina of Time was perhaps my most anticipated video game release ever. I wasn't the only one, however, as it sold 2.5 million copies between it's late November release date and the end of the year. While I had always enjoyed video games, LOZ:OOT came out when I was in 9th grade, perhaps at the peak of my video game obsession. I didn't own a Playstation yet (I received one from my grandmother that Christmas) so I was desperately craving a good adventure or role playing game, two genres that the Nintendo 64 severely lacked. With only Banjo-Kazooie and Legend of the Mystical Ninja to tide me over, the wait for LOZ:OOT was excruciating. I spent hours doodling Legend of Zelda themed doodles in my school notebooks, probably at the expense of paying attention in class. At the time some friends and I were making a lot of home movies and I even wrote a short script about two guys who were doing every crazy job imaginable to make enough money to buy the game. I was really looking forward to this game. What made the waiting even harder was the fact that I was not doing too well during my first semester of high school. I had two honors classes in my course load, algebra and English, and I was really doing pretty poorly in them. It was close to the end of the semester when LOZ:OOT would be released and that didn't bode well for grades. My mother constantly reminded me of this, so perhaps I felt like I could potentially lose my beloved N64, the only thing I cared about besides the Spice Girls at that time. While I eventually manged to pass both classes, it was pretty close. And while I have so few memories of those classes, I still have many warm, fuzzy memories of my video game experiences, so I'm not sure if there's a moral to be learned here or not. 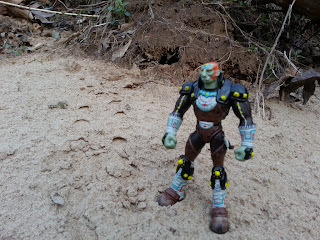 Enough with that stuff, however, let's take a look at some action figures. I've done quite a bit of telling at this point, so let's move on to showing and telling about the figures. 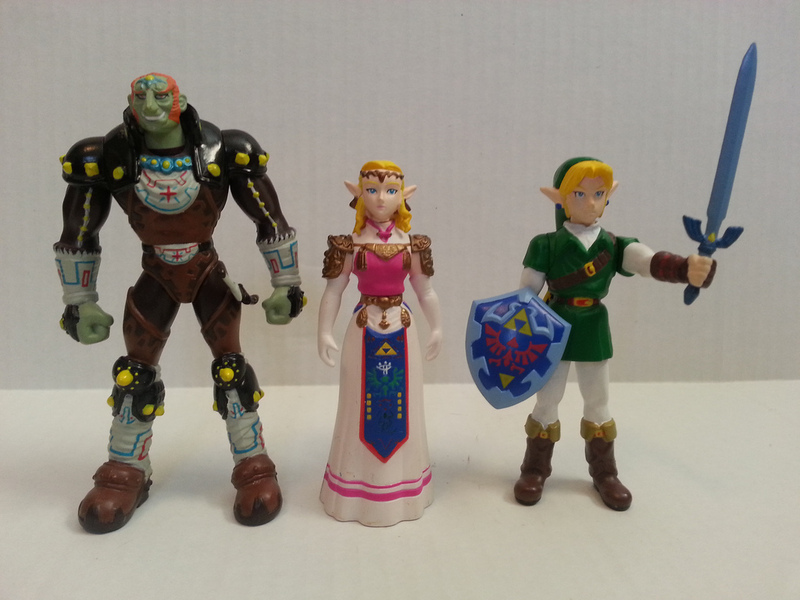 The set consists of Link, Princess Zelda, and Ganondorf. Link and Zelda are about 3 3/4 inches tall while Ganondorf is around 4.5 inches. 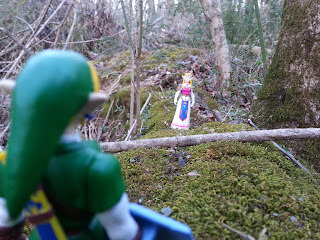 It probably should be mentioned that Link and Zelda are both modeled after their grown-up appearances from OOT. While the sculpting is certainly nothing groundbreaking, I think they still look pretty decent by today's standards and were quite nice by 1998's standards. 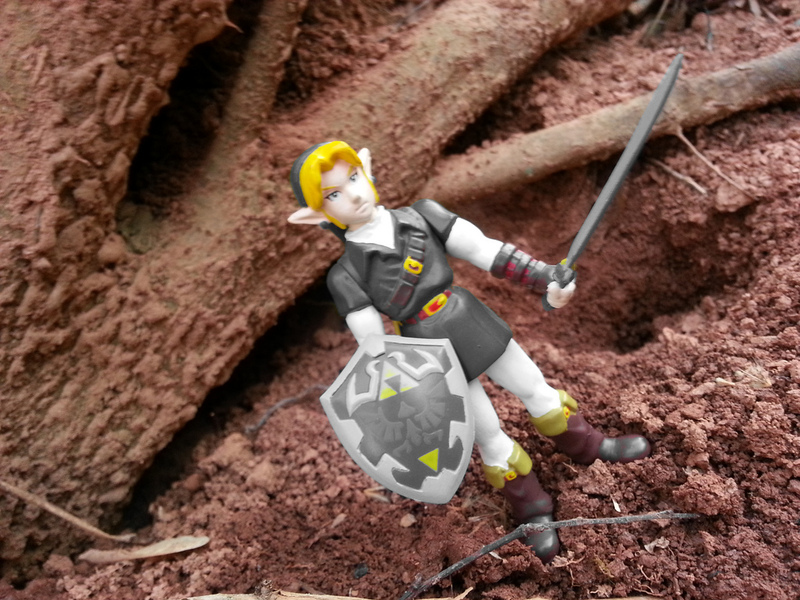 There are nicely sculpted details on each figure, especially Zelda. Her head sculpt is very unique and captures her delicate, elvish features. The elaborate details on her dress are captured with surprising intricacy, especially the small details on the banner that hangs down from her belt. The paint work is quite well done as all of those little details are captured and actually painted. 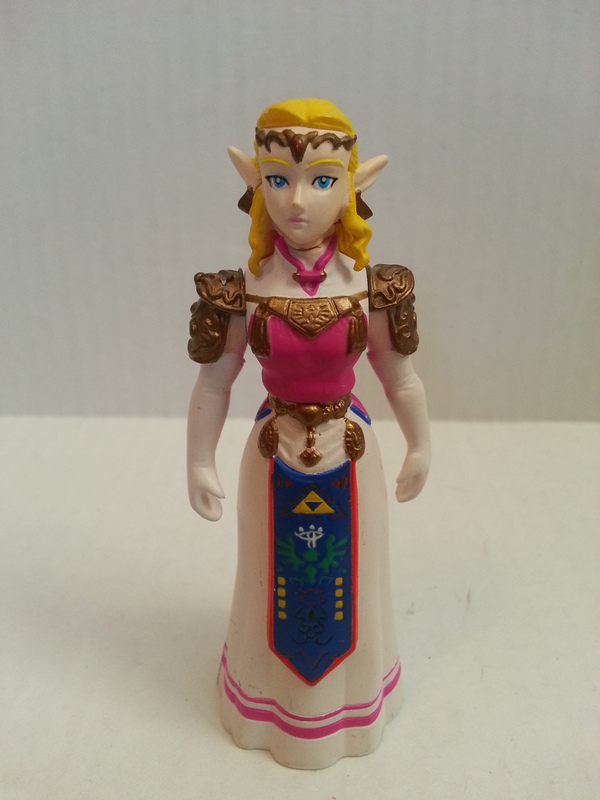 Zelda is solid and hollow from the waist down but has a swivel waist and swivel shoulders. She looks fine but really doesn't do much but stand around being legendary. Princess Zelda. She's kind of a big deal. Link doesn't have as many intricate details as Zelda, but the figure does effectively capture the essence of the character. Decked out in his iconic green tunic and hat, Link also has on leather boots, leather bracers, and his manly tights. He comes with two accessories: a Hylian shield and the Master Sword. He also has a non-functioning sheathe permanently attached to his back. 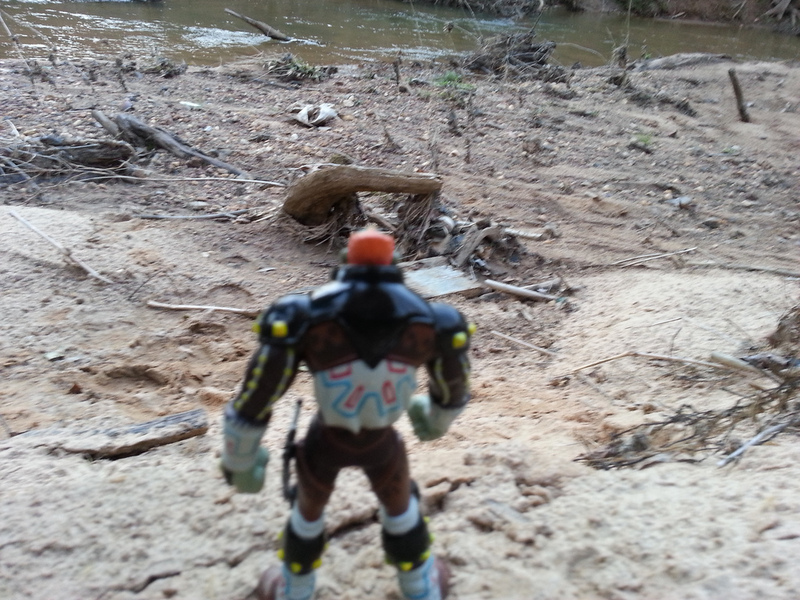 For articulation, Link has a swivel head, swivel shoulders, and swiveling thighs. If Link ever takes an arrow to the knee, he might have a future baking cookies. Ganondorf is a more impressive figure not just because of his size, but because of the various bits and bobs of ornamentation on his armor. 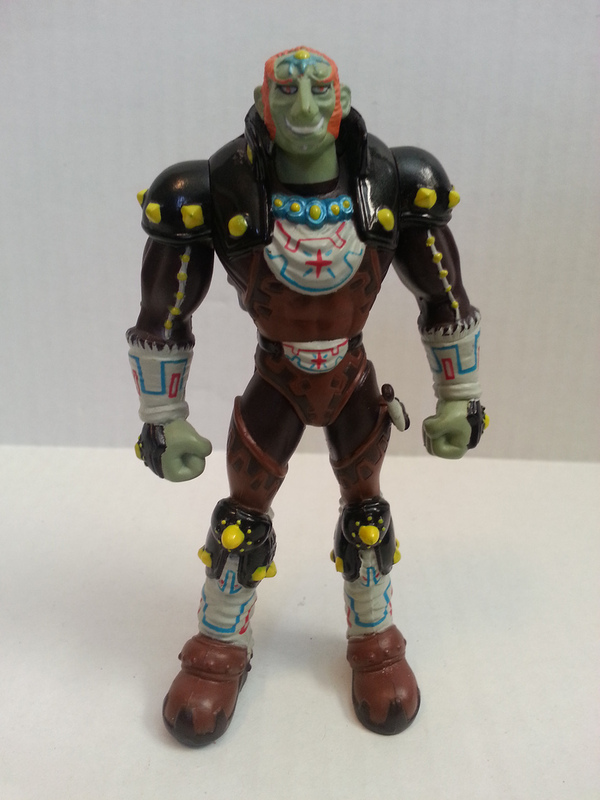 Various designs, studs, and patterns etched into his leather armor give Ganondorf's garb an eclectic appearance, very suitable for a bad guy. While he has no actual accessories, he does have a sheathed dagger attached to his left hip. Ganondorf has ball jointed hips, swivel shoulders, and a very tight swivel neck joint (mine seems stuck and I'm not forcing it). Any more studded leather and they'd have to call this guy Gimpendorf. While these were not the greatest action figures ever made in regards to their playability, I remember being ecstatic at the fact that there were action figures of video game characters; action figures of video game characters were not too common in 1998 and it was novel to have a character as famous as Link in action figure form. 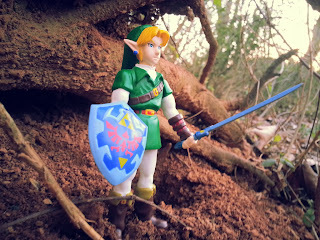 One of the things I do remember doing with these was hunting down various accessories from other toy lines to give Link more stuff. I specifically remember using the grappling hook gun from the 1995 Power of the Force 2 Luke Skywalker figure as Link's hookshot. I also remember swiping a bunch of Playmobil accessories from my collection to equip Link with such as a fishing rod, a jar, and a scarecrow. 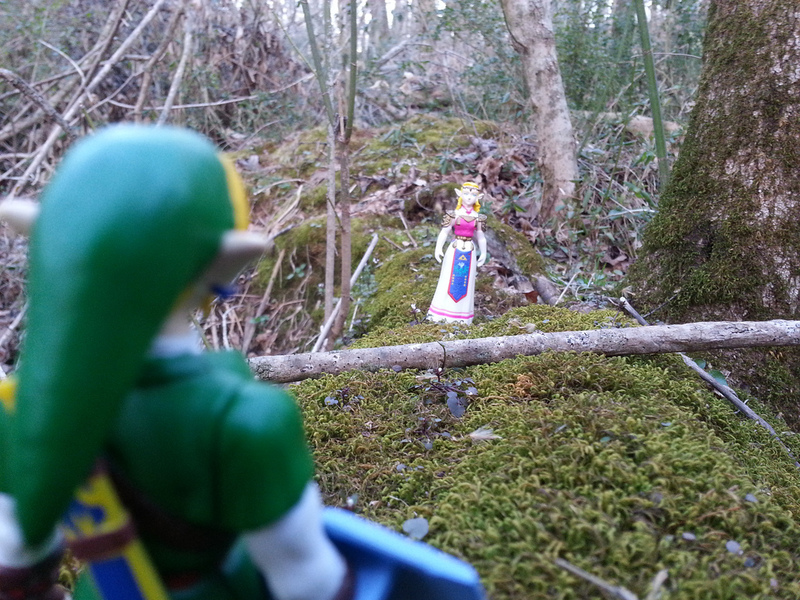 Watch out for that fallen tree limb, Princess! As a very small kid, I remember being very excited whenever video game characters were made into toys. 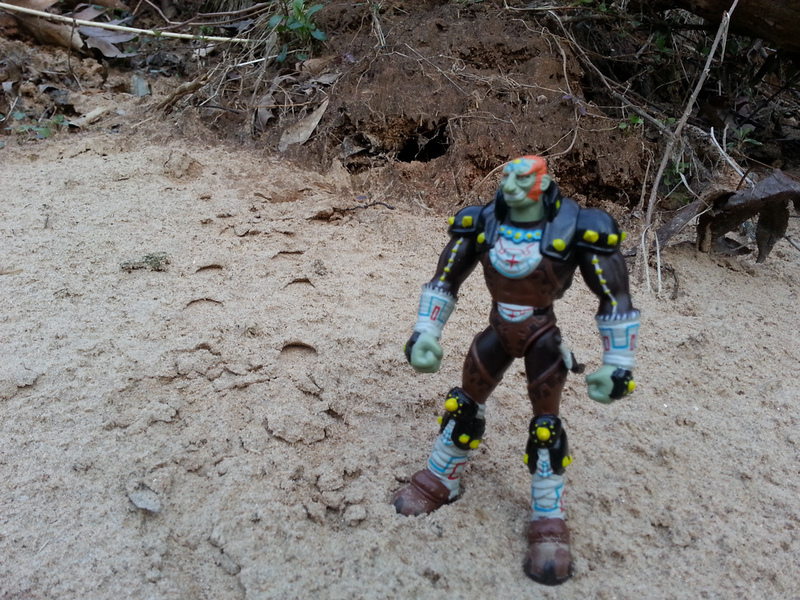 While today video game based figures are quite prominent, they were harder to come by in the late 80s and early 90s. There was a line of solid PVC figures by Applause in the late 80's (I remember having a Mario and King Hippo and Little Mac from Punch Out) as well as various restaurant promotions from McDonalds that gave us some Happy Meal toys from Mario and Sonic the Hedgehog. It really wasn't until the Playstation/ N64 era that figures from video games like Resident Evil, Duke Nukem, and Final Fantasy VII began making their way to toy shelves (although many were still more difficult to find and were only available at special retailers like Electronics Boutique and Babbages). I think Pokemon really opened the doors for licensed video game merchandise to be viewed as profitable to the mass market. What will Link find in this dungeon? Probably roots. After its release in 1986, Nintendo did license some Legend of Zelda product. Nintendo made some Legend of Zelda video game dioramas in 1988, along with such items as breakfast cereal, fruit snacks, and various books and board games. The figures I looked at in this Show & Tell were also released in a bit larger scale at some point in 1998 or 1999, while Toy Biz made a few Ocarina of Time figures (Link, Ganondorf, Zelda, and Impa) in their Video Game Superstars line around the same time. Since that time there have been a variety of minifigures, statues, and othersimilar items available, but rarely any action figures. 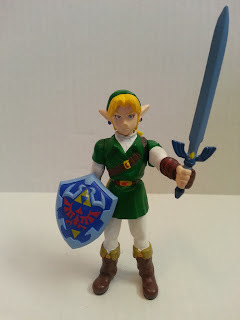 Most recently, Legend of Zelda fans have been excited about the Figma Link that was released by Max Factory. Coming in around 5.5 inches, the figure is exceptionally well articulated but unfortunately only available in Japan (online retailers in the US could not get them directly). Also, check out the proposed Legend of Zelda Lego project on Lego Cuusoo. Fans really want to see more Legend of Zelda product, it would seem. 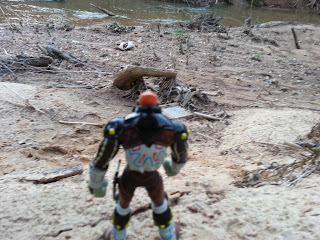 Looking over the wastelands of Hyrule always makes Ganondorf a little wispy. The Legend of Zelda is certainly a property that many fans, like myself, identify with strongly. In talking about the creation of the game, video game legend Shigeru Miyamoto stated that he tried to replicate his childhood experiences of exploring the wilderness and stumbling across amazing things. 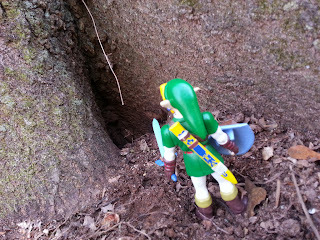 Perhaps that's why the Legend of Zelda is so popular among gamers: it invites us to experience the magical childhood wonder of getting out and exploring the world, constantly discovering new things. It is certainly one of the most beloved video game properties ever, and I'm glad that this set of action figures gives it some representation in my collection. When it comes to Barbecue17, people often wonder how so many reviews and musings about action figures can come from such a lazy boy. They are surprised to learn that he has lots of action figure and Lego reviews on Amazon and a Flickr account of various action figure photos.